The The MTM Mini Thermal Monocular w/IR Marking Laser - Insight Tech-Gear's hand-held thermal imager provides stationary man-sized target detection performance over 400 meters. It's compact, lightweight form and exceptional image quality make the MTM a versatile tool for a wide range of missions, including reconnaissance, and search & rescue. 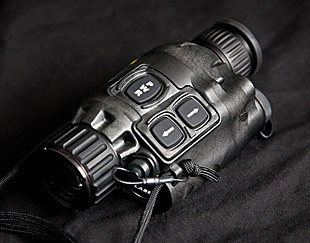 The MTM-V2 Mini Thermal Monocular w/Visible Laser - Insight has listened to the user feedback on the MTM and responded with the MTM-V2. The V2 is a more cost-effective method of putting the industry-leading miniaturization and resolution into the hands of more law enforcement agencies and first responders. The MTM-V2 has reduced the offering of ancillary items (image capture/video interface package, helmet mount and night vision filter/demist shield) without substantially sacrificing the core technology enabling thermal detection, recognition and identification of a scene. The MTM-V2 is more evidence of Insight's continuous efforts to take cutting-edge military inspired designs and put them in the hands of the men and women on the job, every day.